Gastric volvulus is a rare medical entity that requires high index of suspicion for diagnosis and treatment as it has different implications in terms of clinical presentation, diagnosis, imaging support, pathological behavior, and evaluation. When it presents acutely, it may be easily detected. However, in patients with subacute presentation, symptoms are vague due to episodic twisting and untwisting. Definite preoperative diagnosis can be established if imaging is performed during symptomatic interval. The main aim of this report was to stress on the need for keeping high index of suspicion for this medical condition and for imaging the patient during symptomatic interval. Gastric volvulus is a rare medical entity that requires high index of suspicion for diagnosis and treatment. It is torsion or twisting of the stomach. It was first described by Berti in 1866 at an autopsy. Berg carried out the first recorded successful operation on a patient with this condition in 1896, and Rosselet demonstrated the radiological diagnosis of the condition in 1920. When it presents acutely, it has characteristic symptoms and may be easily detected with barium meal studies. In contrast, subacute, intermittent cases present with intermittent vague symptoms from episodic torsion and detorsion. Imaging in these cases is only useful if performed during symptomatic interval. Gastric volvulus can be organoaxial, which occurs around an axis joining the gastroesophageal (GE) junction and the pylorus and is more common, or mesenteroaxial, in which the axis runs from the center of greater curvature of the stomach to porta hepatis. This is approximately at right angles to the axis of rotation of organoaxial volvulus. It can be of a combined variety. Common symptoms may mislead to diagnosis of nonsurgical disease if a detailed history is not taken and physical examination and complete evaluation are not carried out keeping in mind the possibility of this condition. We report two cases of gastric volvulus without associated comorbidity with subsequent imaging and surgical and anatomopathological findings. A 50-year-old female was admitted to hospital with complaints of occasional abdomen pain for the last 4 years. The pain accompanied with bloating sensation was there during meals or shortly thereafter. It was intermittent and nonradiating. Sometimes, the pain used to be relieved on lying down. There was no history of vomiting or any other significant type. The respiratory and cardiovascular systems were unremarkable. Physical examination revealed mild epigastric tenderness. Succussion splash and visible gastric peristalsis were absent. Chest and abdominal radiographs were normal. Upper gastrointestinal (GI) endoscopy showed distorted orientation of the stomach and the scope entered up to antrum with difficulty. 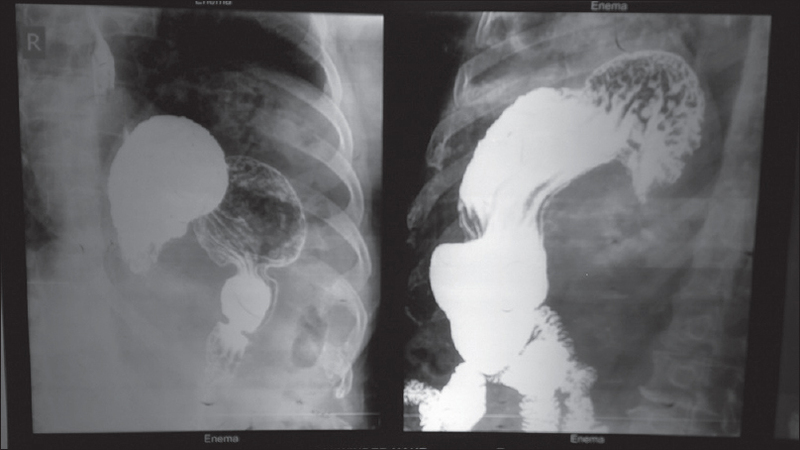 Barium meal series revealed organoaxial volvulus with eventration of the left hemidiaphragm [Figure 1] but with normal mobility. The patient was taken up for surgery during asymptomatic interval. On laparotomy, the left hemidiaphragm was found to be normal, and the stomach was found to be bigger. There were no adhesion bands around the stomach. Grossly, the stomach was healthy and was normally placed. A nonanastomotic anterior gastrojejunostomy was performed. The postoperative stay at the hospital remained uneventful and she was discharged on the 12th postoperative day. The patient is on regular follow-up and is doing fine. A 45-year-old male presented with a history of intermittent epigastric pain. The pain used to appear after consumption of heavy meal lasted for 1–2 h before subsiding. There was no history of vomiting. Initially, the period of remission lasted for about 6–8 months; however, subsequently, attacks of the pain were more frequent and constant. During current admission, the patient had 20 days history of epigastric discomfort, nausea, and vomiting. There was no history of melena or hematemesis. There were no associated comorbidities. Physical examination revealed mild epigastric tenderness. The patient was investigated. There was no evidence of ischemic heart disease. Other abdominal investigations such as X-rays of the chest and abdomen were also normal. Barium meal study confirmed organoaxial gastric volvulus [Figure 2]. Upper GI endoscopy was normal with clear visualization of the pylorus. The computed tomography (CT) scan of the abdomen ruled out secondary causes of gastric volvulus such as hiatus hernia, eventration of diaphragm, or adhesive bands. Intraoperative stomach was of bigger size. Largely, the stomach was healthy and there was no associated hiatus hernia or diaphragmatic hernia. Retrocolic nonanastomotic gastrojejunostomy and anterior gastropexy with the anterior parietal peritoneum were performed. The patient was discharged on the 10th postoperative day. He is on regular follow-up and is doing well. The term “volvulus” is derived from Latin volvere, which means to turn or roll. It was first described by Berti in 1866 at an autopsy on a 60-year-old woman who had died of high closed loop bowel obstruction. The first successful operation was performed by Berg in 1897, and the first delineation of classic triad of Borchardt was carried out in 1904. For this condition to be labeled as gastric volvulus, there should be at least an 180° rotation about an axis, which causes obstruction to foregut. It may occur at any age. In both men and women, the peak incidence occurs in the fifth decade. Volvulus can be primary, resulting from operable conditions, such as diaphragmatic hernia, traumatic defect in diaphragm, and bands that sling up stomach, or nonoperable conditions, such as eventration of diaphragm or abnormal ligament laxity. Obstruction may be acute, recurrent, intermittent, or chronic. In acute gastric volvulus, there is acute epigastric pain and vomiting, followed by retching with inability to vomit and failure to pass nasogastric tube into the stomach, which constitutes the Borchardt triad. Subacute cases may present with early satiety, waterbrash, and intermittent upper abdominal distention., Occasional pain reported in the patients is because of episodic nature of the condition. Chronic volvulus may be symptomless and can be found incidentally on a barium meal examination, chest X-ray, CT, or magnetic resonance imaging. Symptoms resulting from associated pathologies such as hiatus hernia may be present or there can be breathlessness in case of a marked degree of eventration of diaphragm or a large para-esophageal hernia. Depending on the axis of rotation, it can be organoaxial (59%), mesenterioaxial (29%), combined (2%), and unclassified (10%). As far as the extent is concerned, the whole stomach may be implicated total or only a part of stomach is involved partial. Most cases of total volvulus are organoaxial and acute. They are generally associated with diaphragmatic hernia or eventration. In contrast, the mesenterioaxial volvulus is more often idiopathic and partial in extent, being often limited to the mobile distal portion of the stomach. The stomach in organoaxial volvulus tends to lie in a horizontal plane when viewed in plain radiography or barium meal series of the abdomen, which is a distinguishing feature and may aid in diagnosis. 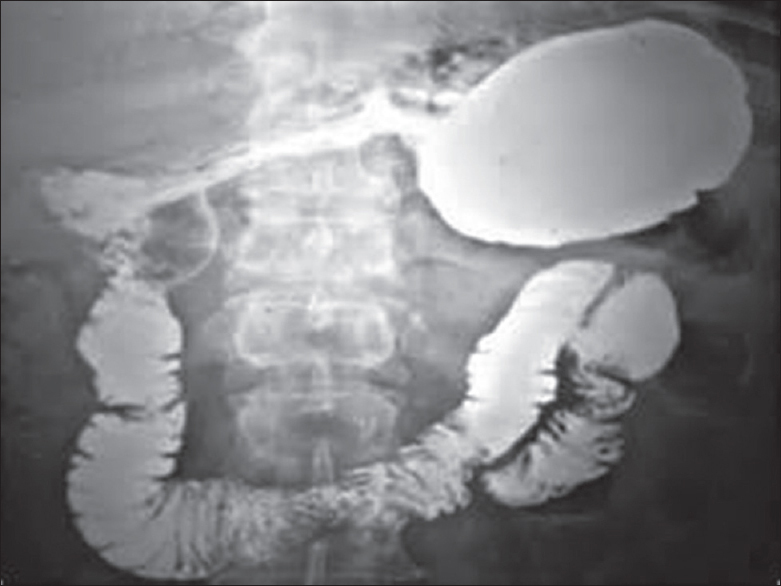 Our case had a similar picture of inverted stomach in barium meal series. In mesenterioaxial volvulus, the stomach lies in the vertical plane with antrum and pylorus rotated anterior and superior to the GE junction. Rotation of stomach at both the axes is termed as combined volvulus. Upper GI endoscopy may show twisting of the gastric folds, or it may be normal as it was in Case 2 reported here. Gastric volvulus is a clinical entity with wide spectrum of pathology, ranging from chronic presentation to acute entity with abrupt clinical presentation, leading to ominous prognosis with eventual outcome of death. Barium meal studies done during symptomatic interval prove to be useful in the early diagnosis of subacute gastric volvulus as the findings are liable to be missed during asymptomatic interval. By keeping high index of suspicion for this condition, diagnosing early and managing it appropriately can be helpful in preventing serious consequences. Cabrera-Tover MG, Redo-Rios J, Tejeda-Tapia H. Volvulo gastric. Informe de un caso. Acta Pediatr Mex 2009;30:163-6. Berti A. Singolar attortigliamento dele' esofago col duodeno seguitta da rapida morte. Gazz Med Ital 1866;9:139. Berg J. Zwei Fälle von Axendrehung des Magens; Operation; Heilung. Nord Med 1897;30:1. Rosselet D. Contribution à l'étude du volvulus de l'estomac. J Radiol Electr 1920;4:341. Paras KP, Ashish K, Ashwani K. Sub-acute gastric volvulus: A case report. J Surg Acad 2013;3:83-5. Borchardt M. Zur pathologie und therapie des magen volvulus. Arch Clin Chir 1904;74:243. Teague WJ, Ackroyd R, Watson DI, Devitt PG. Changing patterns in the management of gastric volvulus over 14 years. Br J Surg 2000;87:358-61. Cozart JC, Clouse RE. Gastric volvulus as a cause of intermittent dysphagia. Dig Dis Sci 1998;43:1057-60. Sanchez S, Vique BL. Stomach volvulus: Why should we remember? Case review. Rev Cheil Radiol 2012;18:12935. Kumaran SV, Pugazhendhi T. Interesting and unusual cases of chronic abdominal pain-intermittent gastric volvulus. Open J Gastroenterol 2012;2:2005. Wasselle JA, Norman J. Acute gastric volvulus: Pathogenesis, diagnosis, and treatment. Am J Gastroenterol 1993;88:1780-4. Tanner NC. Chronic and recurrent volvulus of the stomach with late results of colonic displacement. Am J Surg 1968;115:505-15. Tsang TK, Walker R, Yu DJ. Endoscopic reduction of gastric volvulus: The alpha-loop maneuver. Gastrointest Endosc 1995;42:244-8. Palanivelu C, Rangarajan M, Shetty AR, Senthilkumar R. Laparoscopic suture gastropexy for gastric volvulus: A report of 14 cases. Surg Endosc 2007;21:863-6.